Have you ever screamed, “Who peed on the carpet? !” knowing full well it wasn’t your teenager or mother-in-law who just happened to be out for a visit. It’s safe to say that any human in your house is not a suspect. You didn’t really have to ask the question and certainly didn’t have to scream it out loud. It was the dog. Your adorable, sweet and loving pup is the one peeing in the house. If you live with a dog, you can expect pee to happen. But don’t worry. I’m here to help you understand the whys and what to do about a dog peeing in the house. Dealing with a dog peeing in house? 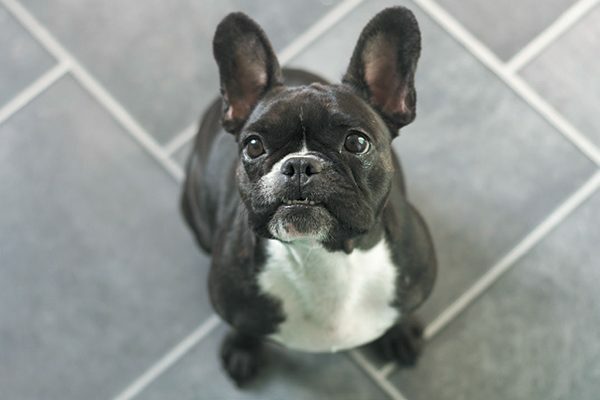 Keep your dog in a room that has easy-to-clean flooring. Photography ©MichaelRenee | Thinkstock. 1. Your pup isn’t housetrained yet. I’m often asked how I housetrained my darling 12-year-old pup, Riggins. I can tell you that it included a celebratory chant and march. When Riggins successfully “did his business” in the sod box on the balcony of our third-story apartment, I would march around the dining room table clapping and chanting a few rounds of, “Treat for the good boy!” My proud pup would march right behind me, head held high, as we made our way to his edible reward. The positive reinforcement was obviously very important. I’m not sure the rest of the ritual was necessary, but it made it more fun. 2. Your dog is dealing with anxiety. If your dog soils inside while you’re gone, he may be suffering from separation anxiety. Tips: Turn to a professional trainer or behaviorist for the most effective way to solve this problem. Also, take your dog to doggie daycare to keep him distracted and mentally engaged in healthy activity. As an extra bonus, your sweet baby will probably be pooped when you pick him up. 3. Your dog is marking. More likely than not, you’ll have to deal with marking at some point in your dog-owning life. As a dogsitter, I can’t tell you how many times a dog and his owner would come in for a meet and greet, and the pup would make a beeline to a piece of furniture and pee on it. “He never does that!” the pup’s parents will exclaim. It turns out they aren’t liars. It very well may be the first (or one of the few times) their pup has marked inside. Imagine if you were that pup. You walk into a strange place, with all new things, everything smells like dog — EVERYTHING. What’s a pup to do? Claim a piece of the pie, that’s what! 4. Your dog is sick or a senior. If you suddenly notice your dog peeing in the house, check in with your vet. There are several health-related issues that could be causing the new behavior. Like us humans, senior dogs can have an issue holding their bladder. I have a senior Chihuahua friend who likes to spend time lying on my chair behind me while I work. Every time I pick him up to set him on my office furniture he pees a little. I deal with it because I love him! Get to the pee when it’s wet. The faster you clean up an accident, the less likely you’ll get stuck with lingering smells. Place paper towels, newspaper or an absorbent chamois on top of and under (if possible) the messed area. Blot, don’t rub, until all the moisture is removed. Blot that same area with clean water. Waited too late and now it’s dry? Don’t use a steam cleaner. You’ll want to, thinking it will make things better. It won’t. The heat will reactivate the smell and make things worse. Use a wet-vac on these spots instead. Use pet odor neutralizer, or try the natural solution of covering the area in baking soda overnight and blotting with a vinegar/water solution in the morning. Use hydrogen peroxide to help with stubborn areas, but spot test an area of your flooring or furniture first to make sure the bleaching properties in the liquid won’t be a problem. When all else fails, call out the professionals. Carpet cleaners will often charge more for areas that are pee stained, but it’s worth it! If you, like Riggins and I did for the first year of his life, live in an apartment or small place, consider a sod box or pee pad as an option. Personally, I got sick of changing out sod and the amount of effort it took to clean the sod box, so I switched over to kitty litter. That’s right, my big 70-plus-pound German Shorthaired Pointer mix is kitty litter trained. It cut back on smell and overall maintenance time. Now, 11 years later, you can get actual doggie litter. Brilliant! Try a synthetic pheromone diffuser, spray or wipe. This synthetic pheromone mimics a dog’s natural comforting pheromones and can help with anxiety. In your house, an area where a dog doesn’t visit is often seen as a “safe” spot to do his business. If you find your dog peeing in the house in the same general area and notice it isn’t a place of high traffic, make it one. Spend some time every day in that part of the house with your dog until he realizes it isn’t his bathroom. Keep dogs in rooms with easy-to-clean flooring and only allow on furniture and beds where covers can be removed and cleaned. Stop laughing. It happens. I’ve seen my tall dog pee on his little friend’s head — accidentally, of course. More than once, an epic pee has made a puddle so big it hits my pup’s feet. Then there’s just plain sloppiness when different body parts get in the way. For dried pee stains, always start by brushing with the tool that works best for your dog’s coat. Try dry shampoo if you don’t have time for a full bath. Disposable wipes are an easy solution and can be carried in your pocket for those pups who never seem to be able to step around their own puddles. If all else fails, seek out a professional groomer. Clean up right away. Marking equals more marking. It feeds on itself like a horrible monster. Keep new things safely out of the way. That includes your mother-in-law’s suitcase. If it’s something new to your pup, it’s more likely to be a target. Diaper up. Dogsitters who take pets into their own home use diapers — especially on male pups. These male wraps don’t have to be ugly. Go online and get your fashion-forward boy some classy threads. Get your dog spayed or neutered. Check with your vet on the best time to do this. Wendy Newell is a former VP of Sales turned dogsitter, which keeps her busy being a dog chauffeur, picking up poop and sacrificing her bed. Wendy and her dog, Riggins, take their always-changing pack of pups on adventures throughout the Los Angeles area. Learn more about them on Facebook at The Active Pack and on Instagram at @wnewell. Ask a Vet: Why Is My Dog Peeing the Bed? The post How to Deal With Your Dog Peeing in the House appeared first on Dogster.